We explain what decimals are and how the concept is explained to primary-school children, as well as how they are taught to relate decimals to money and measurement, the equivalence between fractions and decimals, partitioning, rounding and ordering decimals and adding, subtracting, multiplying and dividing decimals. A decimal is a number expressed in the scale of tens. Commonly speaking we talk about decimals when numbers include a decimal point to represent a whole number plus a fraction of a whole number (tenths, hundredths, etc.). A decimal point is a point or dot used to separate the whole part of a number from the fractional part of a number. 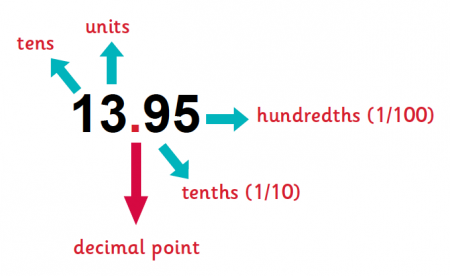 Children need to know that when we talk about decimals, it is as if we are splitting one whole up into smaller parts. 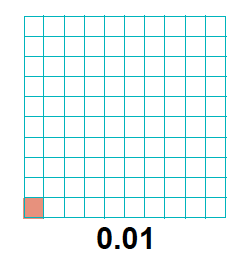 If you coloured in one of the squares in the above diagram, this would be represented as the decimal 0.01 (which is one hundredth or 1/100). 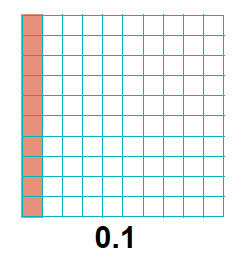 If you coloured in ten of the squares in the above diagram (therefore colouring in 10/100 or 1/10), this would be represented by the decimal 0.1 (children may write 0.10 because they have coloured 10 squares – you need to explain that the zeros after decimal points are always knocked off). 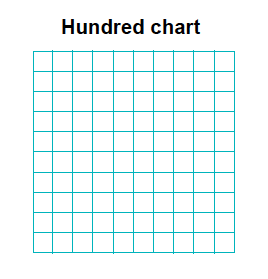 In Year 4, children need to understand the concept of a 'hundredth' and a 'tenth'. They need to be able to write decimal equivalents of any number of tenths and hundredths, for example: 3/10 = 0.3 and 7/100 = 0.07. Children in Year 4 also need to know the effect of multiplying and dividing numbers one-digit and two-digit numbers by 10 and 100 (teachers will talk about digits sliding to the left and right). Compare these decimal numbers: which is larger, 0.9 or 0.4? Or which is bigger out of 0.12 and 0.82? They need to learn efficient written methods for adding and subtracting decimals with up to two places (for example: 6.29 - 3.84). They need to know and use a good written method for multiplying a unit by a decimal (for example: 4 x 8.3). Children need to become more efficient in quickly converting units of measurement, for example: 140cm = 1.4m, 2800g = 2.8kg, 3100ml = 3.1 litres. Here, many children get confused and think that 0.19 must be bigger than 0.9 (because 19 is bigger than 9). It is a good idea to write 0.9 as 0.90 and then explain that the 0 gets knocked off. You could also show them a blank hundred number square and remind them that with 0.9, nine tenths of the 100 number square (so nine columns, each with ten squares) need to be coloured in. They may think that 0.412 is the biggest number, but remind them that because there are only 4 tenths, it is smaller than 0.9, 0.6 and 0.52. In Year 6, children need to start multiplying and dividing numbers by 10, 100 and 1000 (for example: 65 ÷ 100, 5 ÷ 1000, 4.3 x 100, etc.). Again, teachers will say that the decimal point stays in the same place, but the numbers move left or right (depending on whether it is multiplication or division). The number of places they move depends on the number of zeros in the number being calculated with. Children in Year 6 need to start multiplying numbers such as 3 x 1.6 or 4 x 5.9. They may do this either using the grid method (where numbers are partitioned and put in a grid), or by short multiplication (where numbers are put in a column). Learning about decimals is a long and involved process. It is a difficult concept which children can take a while to get the hang of. This is why laying down crucial groundwork in Year 4 is important: children need to be given many chances to order decimals and match simple fractions to decimals (using the blank hundred number square which they can colour in to help them). This means that they will properly understand what a decimal is before they can go onto calculating with them in Year 5 and 6.